In addition to producing a widely-used definition of a stay-at-home dad and releasing statistics on the number of stay-at-home dads, the U.S. Census Bureau also provides data regarding the employment status of married men. The Census estimates the number of husbands in the country, whether they work, and whether their wife works. From this information we can find general statistics on stay-at-home husbands. Based on the narrowest definition of stay-at-home husband — the wife works while the husband does not work and is not looking for work — there are 4,195,000 stay-at-home husbands in the U.S (6.97%). Based on the broadest definition of stay-at-home husband — simply that the husband does not work — there are 17,803,000 stay-at-home husbands in the U.S. (29.6%). In 2011 the U.S. Census Bureau reports there were 60,155,000 married couples in the United States. In 9.98 percent of U.S. married couples, only the wife works. 9.98 percent equates to 6,005,000 married couples in which the husband does not work while the wife works. 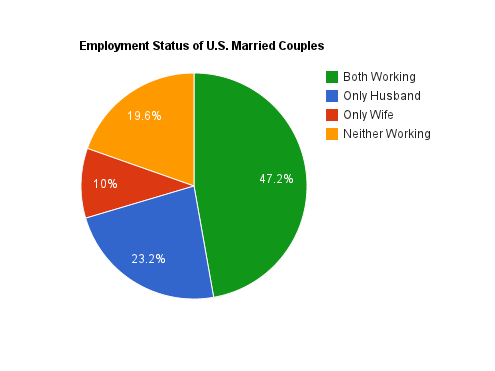 Comparatively, in 23.19 percent of U.S. married couples, only the husband works. 23.19 percent equals 13,950,000 married couples in which there is a stay-at-home wife. The overall data combine two separate categories of stay-at-husbands. One group of stay-at-home husbands is in the labor force, but currently unemployed. The second group of stay-at-home husbands is not in the labor force. People in the first four categories are defined as being “in the labor force”. 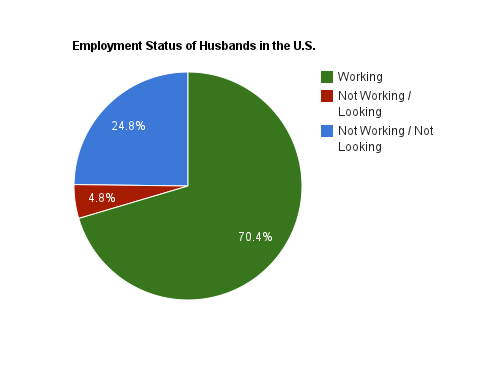 The pie chart shows 29.6% of husbands in the U.S. are not working.